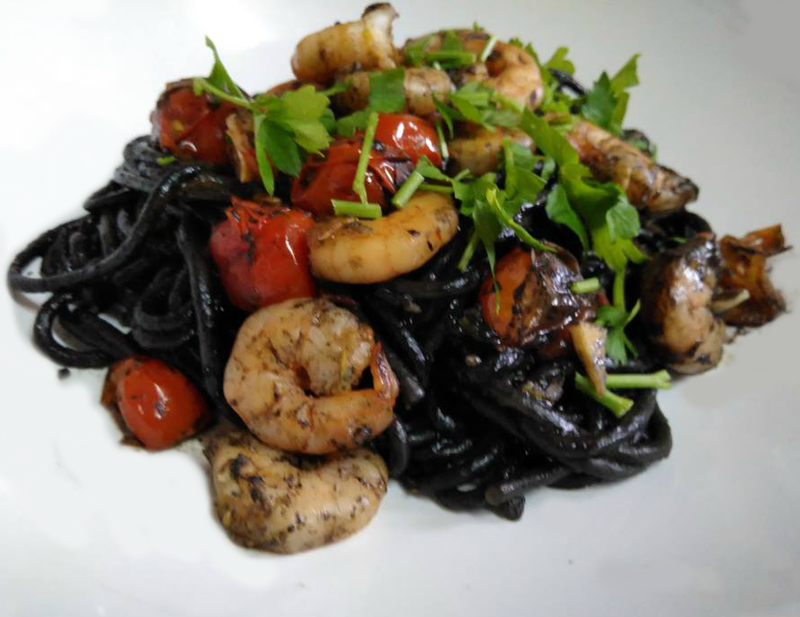 Using black pasta simply wasn't enough here because I cooked black pasta before but it turned out a dark shade of grey. I wanted to bring out the colours and flavours to a different level.. Fortunately I was able to find squid ink at my local supermarket. It has a briny taste with the faint touch of sea saltiness which is perfect when pairing with seafood and it darkened the spaghetti even more! Mission accomplished. 1. Cook the pasta according to package instructions. Drain the pasta and add the squid ink. Stir to coat and then set aside. 2. While the pasta is cooking, heat the oil in a frying pan over a medium heat. Cook the cherry tomatoes for 5 minutes. Add the chopped garlic and cook for another minute. Stir in the prawns and fry until cooked through. 3. Add the pasta to the pan and season well. Stir in the lemon zest and juice to taste. 4. Top with parsley to serve.